WHY SHOULD I INVEST IN THE PHOENIX MARKET? If you are in the real estate business here in phoenix you have most certainly heard the rumor that investor money has moved to other parts of the country. On the surface this may appear to be correct. Markets in Atlanta, Florida, and Texas have certainly seen an up tick in investors from outside the country mainly from Canada and China. With a shrinking inventory here in the valley and the market flattening out it does feel like it has moved elsewhere. 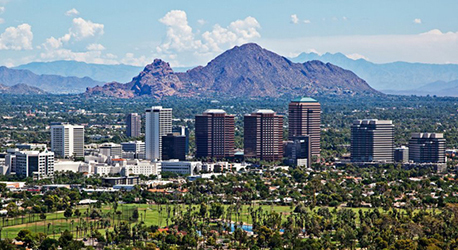 Opportunity though still abounds in the Phoenix market for foreign investors. In 2013 the Arizona Office of Tourism reported more than 770,000 Canadians visited Arizona, which makes up about 52% of international travel spending according to Visa credit card travel spending numbers. Phoenix is a destination for many because of the weather (average winter temp of 60 degrees), recreational opportunities, and strong real estate market. Short term rentals for events like the Superbowl and MLB spring training are everywhere in the Valley. The real estate market is strong but deals can be found with little difficulty. Commercial and multifamily units are and investment opportunity many foreign national buyer are taking advantage of. Property taxes in Arizona are considerably less compared to the rest of the country and renters are numerous. The inventory has been shrinking which means the prevalence of renters is abundant. Many of those renters are quickly approaching the end of their stay in the “foreclosure/short sale Penalty box” and will be looking to make their post recession purchase. With this influx of buyers the inventory will most certainly dry up pushing values even higher. Builders are beginning to purchase land again as well as starting new developments, a great sign for the future. The phoenix market has had it’s troubles but the future looks bright and the opportunity to be a part of that is here now. What does a Canadian need to Get a US loan? The Canadian Dollar is Down What do I Do Now? Why Should I know about Canadian Finance if I’m a Realtor?